Opposite to back counting, the group counting technique is more profitable for players because they work in a group here and have more chances to win as they observe several blackjack tables at once and see which of them are good enough to play at. The great example of gamblers who use group counting system is MIT blackjack team, a world-famous group of gamblers who was able to win millions of dollars by using team play. A group of gamblers play at different blackjack tables each: they have an opportunity to observe several tables at once. When the profitable moment to make a bet comes, group members signal each other that it is a high time to come to that table and make a big bet. Certainly, they use the card counting strategy; moreover, each member of a group has its own role. Big player - the task of this person is to keep the whole team from getting detected. Gorilla - this person does not count cards actually; his/her task is to move from table to table and make maximum bets when s/he was signaled to come to this particular table. Usually, gorillas play the role of a drunken millionaire who is ready to spend much money for the game of blackjack. Spotter - this person is an active player at the table but s/he is not in a hurry to make big bets. His/her task is to count cards and signal a big player or gorilla when it is a high time to join the table. Back-spotter - this person does not sit at the table. S/he observes tables and signals other team members when gorilla should join the game. Group counting became popular and widespread thanks to MIT blackjack team though it was first used by Al Francesco and his blackjack team. Anyway, this phenomenon had been described and shown in various spheres of culture, including literature and cinematography. Bringing Down the House: this book had been written by Ben Mezrich, a former member of MIT team, where he described the methods they used for playing blackjack and winning big sums of money. Thanks to this person, the whole world discovered the phenomenon of MIT team for themselves. 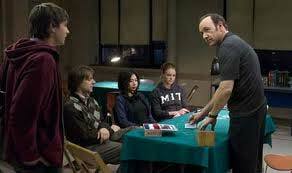 21: this film of Kevin Spacey tells the story of MIT blackjack team when the math professor decides to gather some talented students of Massachusetts Institute of Technology and teach card counting to them. They go to Las Vegas and win much money there. The Last Casino: this is a Canadian film which was based on the book Bringing Down the House and told the story of a few students who were taught to use card counting technique for winning big money at blackjack. 21 is believed to be the remake of this film because the concept of these two movies is the same.